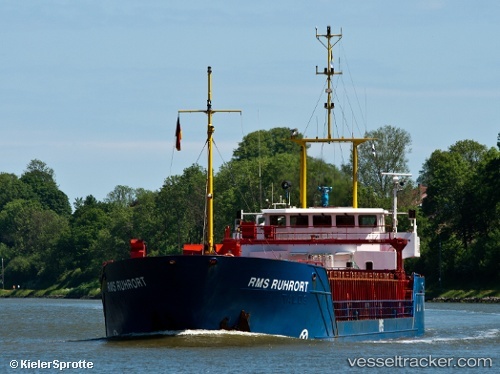 Enroute from Varkaus, where it had sailed on Nov 1, to Rochefort the "RMS Ruhrort" ran into the embankment of the Kiel Canal during the westbound transit on Nov 7, 2017, around 2 a.m., at Fischerhütte. The ship was loaded with a cargo of wood. The 3rd officer lost rudder control and the ship initially veered to port towards the southern embankment. While the helmsman tried to reduce speed, he could avoid getting stuck. But due to the rudder position and the movement away from the southern embankment the ship started to turn hard to starboard so that it was impossible to stop it in spite of more rudder and engine manoevers, so that it finally got stuck. At 2.20 a.m. the vessel managed to back off with own power. The traffic control Brunsbüttel advised it to berth in Brunsbüttel upon completition of canal transit. It berthed at the pilings at the South Port at 4.50 a.m. for investigations. She left again at 6 p.m. and continued the voyage to Rochefort, ETA Nov 11.